Jason Read, “I am an Animal, You’re an Animal Too: Matteo Pasquinelli’s Animal Spirits”, Unemployed Negativity, blog, 1 Jun 2009. This probably needs more critical work to qualify as even a book review, as is it is more of a book report on a book that I think is deserving of critical and political attention. It is worth writing about because I just happened to stumble upon this book in a little anarchist bookstore in Baltimore. First, at least in the order of presentation, is Paolo Virno’s work on philosophical anthropology. In an essay, which I have discussed elsewhere (and that has also been discussed here), Virno contests the reigning idea that criticism of capital and of the state ultimately presupposes some idea of the fundamental goodness of human nature. This is the idea that fuels much of the discussion in undergraduate philosophy classes, pitting Hobbes and his epigones against the various versions of Rousseau. Against this Virno insists that man is evil, or, more to the point man is evil to the same extent that he or she is good: both evil and good stem from the fundamental fact that humanity is an excess of natural determination. For Virno politics should not suppress this fundamental indeterminacy, or ambivalence, by replacing the lack of instinctual determination by an artificial determination, a Leviathan that would compensate for nature by providing a second nature, law would replace instinct. Rather politics ought to cultivate this indeterminacy, as the human institutions of language and ritual do. What does this have to do with the idea of the creative commons? As Pasquinelli argues, the slogan “information wants to be free,” overlooks the conflicts and rivalry that animate even most immaterial production. (Anyone who works in academia is more than familiar with all of the petty antagonisms and jealousies, jealousies that persist even as the fruits of that labor are increasingly available on free online journals). Moreover, much of the internet is fueled by fundamentally anti-social drives, the netporn and warporn that drives sharing and innovation. Rather than seeing the commons as something that exists outside of drives to dominate and control, there is no commons without the antisocial tendencies that animate it. To cite Pasquinelli, “Collective intelligence is the ambivalent exoskeleton of the species: at once the basis for institutions of the common and an extension of humanity’s inborn aggressiveness.” I must admit that I was very interested to see Pasquinelli’s citation of Virno. This is not just because of my interest in Virno, but it suggests that Virno’s essay on evil offers an important reorientation of thought, that it might become a crucial point of reference. Second, and perhaps more familiar, is the relationship between the various commons, or even “illegal” p2p sharing and capitalist exploitation. Celebrations of the “free” nature of shared music and other forms of digital media neglect to examine the way in which this circulation of content becomes the basis of other forms of exploitation. As Pasquinelli writes, “P2P networks may have weakened the music industry, but the surplus has been reallocated in favour of companies producing new forms of hardware or controlling access to the internet.” The sharing of content does not undermine commodification; it only shifts it to a different level, to different industries, from the cd to the ipod. In this instance the animal is no longer the antisocial drives inhabiting the internet but the parasite. The parasite in Michel Serres’ book of the same name is the third that interrupts any peer-to-peer relation. As a file is shared between two computers, a disc burned and handed to two individuals, there is always a third, the owner of the network, or the hardware, that profits from it. This leads Pasquinelli to declare, along with, Vercellone, that “rent is the new profit.” (Pasquinelli also develops this idea through a discussion of this essay by David Harvey). This new form of rent operates in terms of speed and time rather than space. The goal is to beat the eventual dissemination of whatever is produced. These three criticisms of the fetish of code, of creativity, or the new commons, each invoke materiality, but in different senses. In the first, it is a matter of the materiality of the body, of the flesh, which connects us to the animal kingdom even as it distinguishes us from it. In the second case it is a matter of the materiality of capital, of the pursuit of surplus value in its various forms, profit or rent; it is an oddly abstract materiality. While in the third case it is a matter of the materiality of space and history. Matter is, as Althusser famously wrote, discussed in many senses, and the trick is relating these multiple senses, the multiple points in which the airless immateriality of the digital commons intersects with the matter of bodies, capital, and history. It is not a matter of celebrating the new digital commons or of denigrating it as the most recent form of techno-utopianism, but of understanding the relations that such a commons has with desires, profits, and exploitation. As Pasquinelli is quick to point out this commons only relates to a small portion of the economy, that which can be digitally produced and circulated, leaving open how all of this relates to other commodities, to other inequalities. Pasquinelli’s book is perhaps more interesting for the problems that it poses than its solutions. No, that is not fair, there are very interesting analyses here, even if they are burdened at times by a syncretism that combines Ballard, Bataille, Harvey, and Marx. I have nothing against the combination of different perspectives: in fact, it beats the breakdown of thought into “Team Badiou” versus “Team Negri,” as if such academic divisions had anything to do with the world. Such combinations require real theoretical work in order to clarify the connections and limitations. 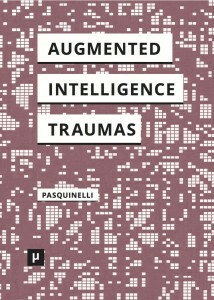 In the end Pasquinelli’s book is a reminder of how much work needs to be done, work to sort out the overlapping intersections of matter and abstraction in contemporary life. You are currently reading Jason Read’s review of Animal Spirits at Matteo Pasquinelli.